Dental hygienists administer preventive dental care, show patients how to take care of teeth and gums, clean teeth stains, and remove deposits left on teeth. They also perform basic gum and teeth examinations and make note of any abnormalities or signs of disease. Dental hygienists utilize various tools to treat patients. Hand, rotary, and ultrasonic tools are utilized to remove plague and stains, clean teeth, and perform routine examinations. Hygienists also utilize x-ray technology to take dental x-rays, and they're occasionally required to develop film. They often use teeth models to teach patients about preventative care and prepare for periodontal therapy. Dental hygienists also apply fluoride and fissure sealants to decrease cavities. 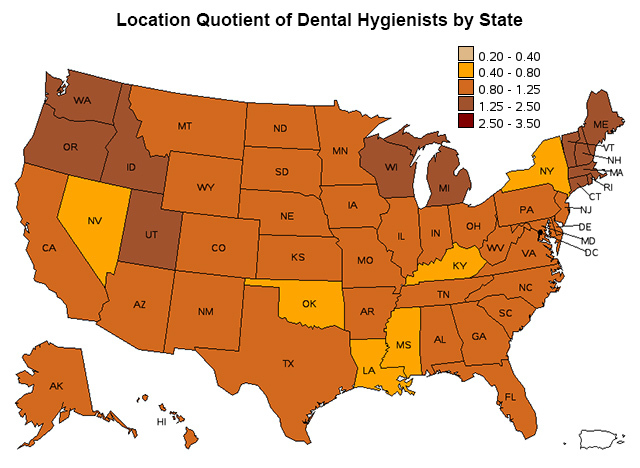 Dental hygienist duties may differ by state. In certain states, hygienists are permitted to apply anesthetics with syringes and other devices. Dental hygienists in other states are permitted to place filling materials and periodontal dressings, finish metal restorations, and remove sutures. Dental hygienists also teach patients how to improve dental hygiene. For example, they often recommend dietary changes to patients with dental problems, teach patients how to choose toothbrushes, and show them how to properly floss and brush their teeth. Hygienists may make simple dental diagnoses and setup diagnostic tests that are administered by dentists. Hygienists often work alongside dentists during dental procedures. As of 2014, there were approximately 200,000 dental hygienists employed in the United States. Over 95% of dental hygienists work in dentist offices assisting with dental procedures. A small percentage of dental hygienists work in outpatient clinics, doctor's offcies and at schools. In order to protect themselves against infectious diseases that can be spread by patients, dental hygienists ward protective gear and clothing, including latex gloves, surgical masks, aprons and safety glasses. Dental hygienists are often required to take x rays of patients' teeth. When doing so, dental hygienists follow strict guidlines to protect themselves and their patients from radiation. To become a dental hygienist, candidates must earn a 2 to 3-year associate's degree in dental hygiene from an accredited school and satisfy state licensure requirements. Most dental hygienist training programs only admit applicants who hold high school degrees and have submitted test scores from college entrance exams. Aspiring dental hygienists should take math, chemistry, and biology classes during high school. Some training programs only admit students who've completed a year or more of college. Each school usually has different admittance requirements. As of 2015, the Commission on Dental Accreditation (CODA) recognized 301 dental hygiene training programs. Students who graduate from dental hygiene programs usually earn associate's degrees, but some schools offer professional certificates or bachelor's and master's degrees in dental hygiene. Most dentists only hire hygienists who hold at least an associate's degree. Those who teach, conduct research, specialize in clinical practice, or supervise public health programs typically hold bachelor's or master's degrees. 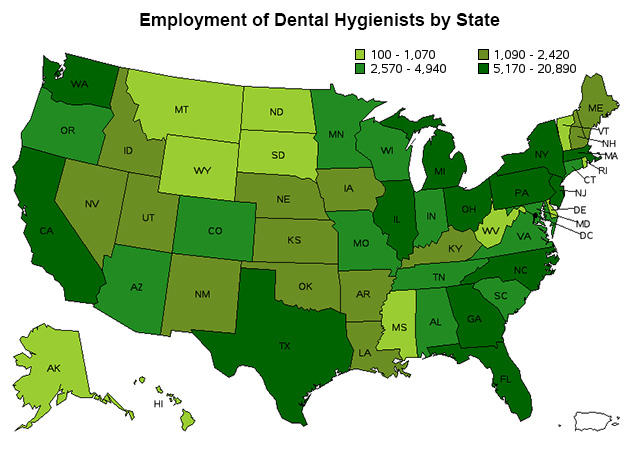 The following map shows the number of dental hygienists employed by state. Roughly half of dental hygienists make over $71,500 a year, and half make less. The top 10% of dental hygienists make more than $97,400 a year, while the bottom 10% make less than $49,200 a year. In addition to an attractive salary, dental hygienists often receive other benefits, including paid vacation, health insurance, time off when ill and retirement benefits. Often, fringe benefits are only offered to dental hygienists who are employed full time. Only about half of dental hygienists are employed full time. 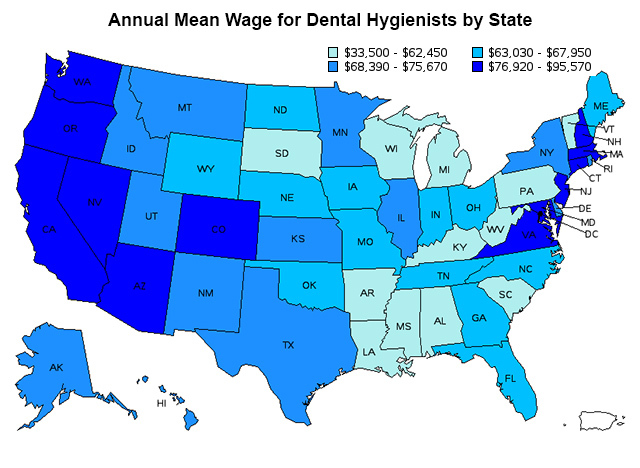 The following map shows the annual mean wage of dental hygienists by state. The following are the five states that offer the highest earning potential for dental hygienists. The following are the top 10 metro areas in the United States that offer the highest earning potential for dental hygienists. Dental hygienist is among the fasting growing professions nationwide. However, in certain areas, competition for open positions is intense. Job growth for dental hygienists is anticipated to increase by 19 percent through 2024, an above average rate compared to all other professions in the United States. Demand for dental hygienists will be driven by growing demand for dental services and increased job responsibilities. Demand for dental care will increase as elderly populations continue to age, greater emphasis is placed on preventative care, and more people continue to retain their natural teeth. To satisfy demand, dental clinics will hire more dental hygienists to administer routine services dentists previously administered. A growing demand for cosmetic dentistry, including teeth-whitening, and advancing technology that allows for less invasive procedures will also drive demand for more dental hygienists. As more Americans take advantage of federal health insurance reform, and gain access to better dental insurance coverage, dental services, including those administered by dental hygienists, will continue to grow – as will the need for more dental hygienists.